I recently conducted an unscientific polling of 20 random individuals to find out who many know what an Amaryllis is. I showed them an actual Amaryllis and asked one question. "Do you know what this is?" The particular amaryllis I showed them was sitting on a bed of decorative rocks in a large clear glass vase so the entire bulb, some foliage, and a big flower bud were all in full view. Do you know how many people correctly identified the Amaryllis? Yes, an unbelievable 15 out of 20 people, some of whom claimed gardening as a hobby, had no idea what the Amaryllis was. A few offered a guess. Amaryllis, they barely know thee, but I love thee quite a bit. I cannot image celebrating Christmas without at least one Amaryllis in bloom and some years I grow half a dozen. I mostly treat them as annuals, but I have successfully grown some on and coaxed them into flowering again a year later. It isn't hard to do when you grow them as house plants. Just stop watering them in the summertime, which is easy to do as summertime is also known as "the season of the neglected house plant". Then in the fall, which is also known as the "oh gosh my house plants sure look neglected I better give them better care season", cut off the foliage, which is probably brown by then because the plant wasn't watered for most of the summer, and start watering again. 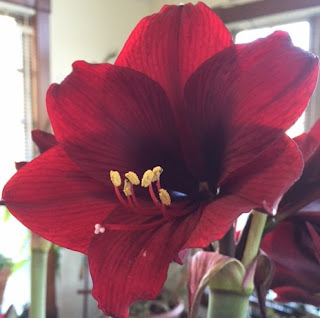 Then you can enjoy the Amaryllis blooms during the midst of winter, also known as the "what would I do without house plants season". My Amaryllis bulbs, both the one in the vase and others potted up in my sunroom, look pretty good to me right now, all in bloom, right on time for Christmas. I'm enjoying them, and talking nice to them, and re-assuring them that though many people barely know them, I know them, love them, and will always have them. Although to some of us, that's a hippeastrum. Lovely flower, whatever you call it. I love them but I don't always remember to get one for the holidays...and coming winter shut in phase. They are the happiest winter bloomer. The ones I won here at May Dreams Gardens arrived and are planted. Thanks again for hosting the contest! I try to get a different amaryllis every year. I am lucky to live in the south. I put them out in the ground in late spring. I have many colors all around my yard now. This year's amaryllis is Monte Carlo. I anticipate the three flowers to open any day now. A new face every year! Tests like the one you performed are always eye opening, we can assume knowledge is there when it is not. now I need to go buy an amaryllis! I've had some beautiful ones over the years. I used to store them and get them to rebloom. One year something infected the bulbs. That was the end of my amaryllis days. After your Longfield Gardens giveaway, I ordered two of their amaryllis bulbs. They are BIG bulbs! Won't bloom for Christmas, but will come along in the deep of winter when they are most needed. I chose Amorice and Evergreen. Thanks for introducing me to Longfield. I am trying forcing them in water for the first time. At first the water smelled horrible, but the addition of a chunk of Japanese charcoal seems to have fixed that. This is the first year I've gone without an amaryllis, and I'm feeling quite bereft without them. I suppose I'll need to find some on Christmas clearance.